"Diderot and Stanislavsky about Digital Actor"
... and Kuleshov's experiments and the new anthropology of the actor : questia.com -- Inside the Film Factory: New Approaches to Russian and Soviet Cinema Book by Ian Christie, Richard Taylor; Routledge, 1991. 256 pgs. Kuleshov's conception of the actor is not distinguished by any great originality, but is borrowed almost entirely from theatre theory of the 1910s and the beginning of the 1920s. There was at that time in Russia an active reaction against the method of Stanislavsky's Moscow Art Theatre. The principle of the transformation and embodiment of the actor in the character was being criticised from all sides. At the same time a new anthropology of acting was being actively elaborated at the beginning of the 1910s: the major influences on it were the views of two theorists, the Frenchman F.A. Delsarte and the Swiss J. Dalcroze. The teaching of Delsarte figures among the teachings of physiognomy, which were very popular in the nineteenth century and which owed much, for instance, to the old works of G.G. Engel. He had elaborated a highly pedantic lexicon of gestures, each of which, according to the author, had a direct correlation with the psychological state of man. The originality of Delsarte's teaching consisted to a large extent in the accentuation of the rhythmic side of mime and gesture that is predictable in a system created by a professional musician. Dalcroze created a system of rhythmic gymnastics which was extremely popular in the 1910s and on which he based an original aesthetic theory. Delsarte's ideas began to penetrate Russia at the very beginning of the twentieth century. Yuri A. Ozarovsky lectured on his teaching as early as 1903 1 but it achieved real popularity around 1910-13 when the former director of the Imperial Theatres, Prince Sergei Volkonsky, became its propagandist. He published a series of articles on Delsarte and Dalcroze in the periodical Apollon and then published, under that periodical's imprint, several books giving a detailed exposition of the new acting system. Since the Volkonsky-Delsarte-Dalcroze system had a fundamental significance for film theory at the beginning of the 1920s, and in particular for Kuleshov, we must familiarise ourselves briefly with at least those elements that were later used by film-makers. The Volkonsky system can conventionally be divided into two parts: the theoretical system of Dalcroze and the technological system of Delsarte, synthesised into a single whole. In 1912 Volkonsky published his translation of the book by Dalcroze's disciple, Jean d'Udine, that had gone into his system organically and represented a kind of philosophical reworking of the teaching of the Geneva rhythmologist (d'Udine relied mainly on Le Dantec, Bergson et al.). D'Udine was an ardent propagandist of the idea of synaesthesia and he compared man to a dynamo (in one of the first manifestations of the machine ethic in aesthetics) through which the rhythmic synaesthetic inductive impulses pass. Human emotion is expressed in external movement and, what is more, that movement can 'inductively' provoke in man the emotion that gave rise to the movement. He maintained that 'for every emotion, of whatever kind, there is a corresponding body movement of some sort: it is through that movement that the complex synaesthetic transfer that accompanies any work of art is accomplished'. 2 To ensure its artistic effectivity every movement has to be rhythmicised and music is the synaesthetic equivalent of body, movement: 'the ability to express feelings through musical combinations consists in nothing other than finding sound movements whose subtle rhythm corresponds to the body movement of someone experiencing enjoyment or suffering.' 3 It is from this that d'Udine derives the idea of the mimetic character of music, 'imitating' the internal rhythms that accompany the phenomena that exist in life. Rhythmicised body movements must, according to d'Udine, be 'segmentary'-that is, they must be fixed in certain poses: 'The manifestation of real artistic quality' requires that the rhythms, whether felt or imagined, be crystallised in an immutable form', 4 he declared, making an analogy between human expressive movement and the musical notation that records a melody. D'Udine promoted music to the position of the metalanguage of art: 'This would allow us', he wrote, 'to apply my plastic definition of melody, which is that all melody is a series of consecutive propositions, to the whole field of aesthetics and in the end that would allow us to say in more general terms: every work of art is a series of consecutive propositions.' 5 D'Udine concluded his work with this characteristic definition of art: art is 'the transmission of an emotion by means of stylised natural rhythm'. In his articles 'Man as Material for Art. Music. Body. Dance' and 'Man and Rhythm. The System and School of Jacque-Dalcroze' (1912), Volkonsky refines some of the theses of the Swiss theorist: 'the first condition for creation in art is the adoption of a different rhythm, whether in the voice, in the movements of the body or in the soul's emotions.' 7 Furthermore, this different rhythm must be assimilated by the actor to the point where it becomes an unconscious automatism: 'Consciousness only plays its proper role when it is transformed into unconsciousness, that is when everything that has been acquired through consciousness is transformed into the mechanical impossibility of doing otherwise.' 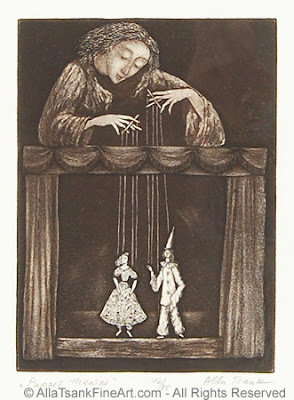 8 Volkonsky's actor is distinguished from Gordon Craig's 'supermarionette' precisely because his rhythmicised movements are driven to unconsciousness by inner, conscious impulses and not by simple mechanical submission to the director's will. This combination, which seems strange to us now, of mechanics and 'feeling' differentiates Volkonsky's ideas sharply from later Constructivism. We see before us the fruit of a meandering movement of thought that derived from the old physiognomy of pantomime and ballet but already anticipated the next step towards the machine ethic of the 1920s. ... Acting, as far as Diderot was concerned, is about simulation. If you're meant to act the part of someone who's lost a loved one, and you go on stage and think of terribly sad things in your own life that make you cry, then as far as Diderot is concerned you aren't acting any more: you've lost artistic control of the situation. The finest actor, Diderot would argue, is one who can cry on stage in a completely convincing way, yet feel absolutely nothing. This is the paradox of the actor. ... A step toward separating the system from its concrete expression was taken by E. B. Vakhtangov, whose stylistic aspirations were so very different from the initial naturalism of the Arts Theater but who, nevertheless, was aware that his own system was an application to new stylistic tasks of the basic ideas of Stanislavsky. This can be demonstrated with the example of Vakhtangov's work on the staging of Princess Turandot. Wishing to project from the stage not simply the content of the tale, but his own contemporary relation to the tale, his irony, a smile "addressed to the tragic content of the tale," Vakhtangov creates a new content for the play. B. E. Zakhava tells of a remarkable case from the history of the staging of this play: "At the first rehearsals, Vakhtangov used this device. He proposed the actors play not the roles indicated in the text of the play, but Italian actors playing these roles ... For example, he proposed that the actress playing the role of Adelma play not Adelma, but an Italian actress playing Adelma. He improvised (in the theme, supposing she were the wife of the director of the troupe and the mistress at the opening, that she is wearing broken shoes, that they are too big for her and when she walks, they flap at the heel, slap the floor, etc. Another actress playing Zelima is an idler who does not want to act, and she does not at all hide this from the public (she wants to sleep)" (1930, pp. 143-144). Thus, we see that Vakhtangov directly changes the content of the play he is given, but in the form of its presentation, he depended on the same foundation that was put in place in the system of Stanislavsky: Stanislavsky taught that finding the truth of feelings on the stage is an internal justification of each stage form of behavior. Zakhava says: "Internal justification, the basic requirement of Stanislavsky, remains as before one of the basic requirements of Vakhtangov, only the content itself of these feelings is entirely different with Vakhtangov than with Stanislavsky ... If the feelings now become different, if they require different theatrical means of expression, still the truth of these feelings is as it was and will always be unchangeably the basis of the soil on which only the flowers of genuine great art can grow." (ibid., p. 133). The new anthropology of the actor spread through Russia with unusual speed. A large number of centres for Dalcrozian rhythmic gymnastics [eurhythmics] were set up and Volkonsky even started to publish a specialised periodical Rhythmic Gymnastics Courses [Listki kursov ritmicheskoi gimnastiki] (1913-14). In St Petersburg D.M. Musina-Ozarovskaya set up a 'School for Stage Expressiveness' and then the 'One Art' society, which set itself the aim of promoting a future synthesis of the arts on the basis of Delsarte's system. Representatives of the Petersburg artistic elite joined the society. Yuri A, Ozarovsky published a Delsartian journal called Voice and Speech [Golos i rech'] But the principal propagandist was Volkonsky, who gave hundreds of lectures about his system. The spread of the new anthropology was facilitated by the flowering of the Russian ballet, the tours of Isadora Duncan, etc. The ballet seemed for some time to be the principal expression of the new anthropological model of the actor and, more broadly, of man. Because of the war the studio never started work. After the Revolution and after holding the leading position in VFKO, Gardin achieved the improbable, the opening of the First State Cinema School, which he headed. Initially Gardin's plan had a Cyclopean character: it was his intention to open ten schools, each with a thousand students, and to create on the basis of these a new 'army' of film-makers 17 and, although this was not made clear, perhaps also a new anthropological type of man. There is little doubt that the existence of the school owed much to Gardin's enthusiasm for Volkonsky's new anthropology. It is enough to look at the complement of teachers. First Sergei Volkonsky was invited to teach there and take charge of the courses on the 'system of expressive man'. Many years later Gardin recalled Volkonsky's courses from 1919-20: 'The students had their hands and feet entangled in concentric, normal-eccentric and concentro-concentric positions.' 18 Then there was Ilyin, of whom Kuleshov wrote in his memoirs, 'Ilyin was an enthusiastic admirer of the Delsarte school and applied its teachings to our work at every opportunity. In addition, he developed and perfected it himself. We were extremely pleased with Ilyin's research.' 19 Elsewhere Kuleshov affirmed that it was in fact Ilyin who introduced him to the Delsarte system. 20 One of the other teachers was Nikolai Foregger, creator of the machine dances which were to become famous in the 1920s and were so obviously linked to the 'new anthropology'. At one time the school was headed by Valentin Turkin who shared the general interest in Volkonsky's system. The school maintained particularly close contacts with the Experimental Heroic Theatre directed by Boris Ferdinandov, who had created the Dalcrozian theory of 'metro-rhythm'. For a while Kuleshov's Workshop even took shelter in the building of this theatre. The appearance within the film school's walls of Kuleshov, who had been Gardin's prot��g�� since 1918 (when Gardin had invited him to take charge of the newsreel and re-editing section of VFKO), was to be expected. Kuleshov professed a Delsartism that was even more orthodox than that of the other teachers. The foundations of future Soviet film theory were being laid around the film school and in its midst. We might apparently even be justified in talking about a specific GTK-GIK film theory. 21 Before we define the main body of ideas of this collective theory, we must answer the question: why has the history of film thought ignored this important theoretical complex? We can cite a whole range of reasons. There is no written record of the ideas expressed by many of the participants in the collective. Gardin, for example, never published his theoretical findings which became known only in 1949 after their detailed exposition in his Memoirs. We know practically nothing about Ilyin's ideas. By 1922-3 there was in addition a noticeable distance emerging between Kuleshov, who had adopted the positions of LEF [Levyi front iskusstv (Left Front of the Arts)], and his former associates (above all Gardin), who had maintained closer links with the pre-Revolutionary artistic tradition. And we must not forget personal quarrels. At the beginning of the 1920s there was a break between Kuleshov and Ilyin, which in Kuleshov's later memoirs was attributed to Ilyin's scholastic Delsartism, 22 although in this conflict we must obviously not exclude personal motives. The break with Turkin followed in 1925 after the publication of his book The Cinema Actor [Kino-akter], which contained scarcely veiled attacks on Kuleshov. Thus, at the very moment when Kuleshov's theory was beginning to achieve widespread popularity-1925-the collective of the film school was disintegrating and the traces of its former unity were being lost in later polemics and personal conflicts. Today the shooting was difficult. In the schemata that I definitively adopted for absolutely every draft close-up montage combination (and also for the temporal calculations of the mechanics of spiritual life), I am beginning to assemble the individual signs that characterise each element in the four-part formula that I took as the basis for all schemata: 1. Sensation (impression) is the external or internal stimulant. 2. Perception is the orientation. 3. Comprehension is the brake. The desire to divide action into such minute physiological phases (and the enormous role that he attributed to the eye in this process of movement) led Gardin towards the widespread use of close-ups, that is, the cutting off of the actor by the frame of the shot, which was partly analogous to Delsarte's 'independence of the limbs from one another'. The desire to set out the elements of action according to a precise four-part formula created the necessity for properly thought-out 'close-up montage combinations'. Hence the requirements of the new anthropology of the actor encouraged in Gardin's mind the idea of montage. Gardin himself recognised perfectly the significance of these theoretical studies: That is how my first thoughts arose on the possibilities of montage combinations and on the conversion of acting to the expressive movement of the parts of the actor's body and to the condition of objects symbolising the actions of man', he wrote. 25 This formulation is interesting because we can still detect in it an indissoluble link between the idea of montage and the body of the actor: the 'possibilities of montage combinations' are directly linked to the 'conversion of acting to the expressive movement of the parts of the actor's body'. Montage was thus understood as a cinematographic form of organisation of the actor's behaviour. Hence montage was also understood as the rhythmological key, given that the film was, in the spirit of Dalcroze and Volkonsky, proclaimed to be a 'recording' of rhythm. The similarity to Gardin's experiments with the screens is striking: 1,245 compositions are of course the product of a gigantic detailed study of Volkonsky's 81 eye expressions. Let us note in passing that Volkonsky's faces were demonstrated on the screen and that Gardin's velvet screens corresponded to this pseudocinema. This polemic explains the origin of one of Kuleshov's experiments, 'the dance'. But it is equally evident that it also follows the broad outlines of film theory at that time, from the rhythmic anthropology of man to rhythmic montage as its cinematographic quintessence. In this sense Kuleshov was not very original. Gardin was thinking along the same lines and Turkin was evolving in the same direction. In 1918 he was fighting for the model actor. And there is nothing more natural than that in 1922 he should be one of the principal propagandists of rhythmic montage. Everything in this statement is very characteristic of the type of thinking associated with the film school group. Everything begins with the actor, then passes to rhythm and concludes with the assertion that the rhythmic construction of a film is montage. Turkin's position is of course close to Kuleshov's position in 1918. But we should not assume that this is the result of a straightforward borrowing. In 1918 Kuleshov was saying the same thing as Gardin. In 1922 Turkin is repeating both of them. What we have here is not so much the product of the individual creativity of each one of them as the fundamental principle of what we have already called 'the "film school" film theory'. Figure 4 'Every emotion is accompanied by a specific sign in the body and face,' Vladimir Inkizhinov (left), Leonid Obolensky and Alexandra Khokhlova in a 1923 rooftop '��tude' by the Kuleshov Workshop. 1. An incorrect exercise. In the first frame you show a man with a look of hatred: in the second another man whose look answers the first-triumph, etc. It is not difficult to see that Kuleshov was proposing to reconstruct his own experiment with Mosjoukine in the velvet frames. But the most interesting thing in the article was the fact that the Mosjoukine experiment, which was not directly mentioned, was inextricably linked to the body of the actor understood as the universal model for montage: 'If we mask the actor and force him to strike a sad pose, the mask will express sadness: but if the actor strikes a joyful pose, it will look to us as if the mask is joyful too.' 43 Kuleshov was already re-thinking the Delsarte-Volkonsky system as a source of pure montage: segments of the human body are like signs opposed to one another and they make sense in precisely that opposition. The description of the man in the mask is a direct transposition on to the actor's body of the 'Kuleshov effect', in which Mosjoukine's mask-like face changed its expression within various montage juxtapositions. Of these six experiments the history of cinema has preserved the memory of only two: the 'created man' and 'creative geography'-the others are practically never mentioned. But, if we look at the whole programme of experiments in its entirety, we can easily see that the sixth experiment fell within the Dalcroze-Volkonsky orbit. The third experiment recalled the Mosjoukine experiment but was partly reformulated in the categories of reflexology. The first, second, fourth and fifth experiments are closely linked to one another. First we have the non-montage image of a dance (not specifically cinematographic), then we are offered three different types of the dismemberment and combination of objects. The dance is composed of fragments that have been filmed with a single model, while the fourth and fifth experiments assemble the body of a man or the 'body' of the world from fragments of various objects. The Delsartian idea of dismemberment and combination is here clearly evident. Judging by the frequency of the references in the texts and its place in the list, the 'dance' experiment was the most important to Kuleshov, although in later analyses it has been completely overshadowed. The significance of this experiment does not depend merely on the retrospective polemic with the article by Anna Lee, to which we have referred. The dance was essentially the only subject which clearly raised the problem of rhythm. Rhythm had been postulated as the principal aim of montage, but neither the Mosjoukine experiment nor the 'created man' were complete responses to this aim. Although for Ferdinandov montage was in many ways an external element, it was also subject to his metro-rhythm: 'The same laws of metro-rhythm, tempo, accord, theatrical harmony and counterpoint also guide the construction of theatrical montage��and its combination with the actor's basic work.' 50 Thus a kind of choreography was promoted to the position of an organisational principle in relation to montage as well. Furthermore the montage principle was also introduced into the actual work of the actor. Ferdinandov's theatre was called 'normative' or 'analytical' theatre precisely because it postulated the necessity for the montage segmentation of movements: 'you can construct a stage work on a succession of elementary movements, using the movement of only one organ of the body at each moment in time', 51 wrote the theatre enthusiast Nikolai Lvov. This 'successive' and analytical plastic art was described by Ferdinandov's opponent Ippolit Sokolov as a collection of 'typically Jewish artificial little gestures bordering on caricature��an insupportable uniformity of conventional and schematic movements'. 52 In many ways theatre was being constructed as an analogue of the system of 'notation' of rhythmicised movements. Thus even in 1925 the 'dance' experiment preserved the importance of a 'symbol of f faith' as the supreme expression of the link between montage and the new anthropology. Montage was now the expression of the new conception of man and derived literally from the human body, as a record of its movement, as the mechanical expression of its natural rhythm, as the embodiment of the concept of the body analytically dismembered. Montage was now induced by body rhythm, by the body's new being, in the broadest sense of the word. Man's body was the raw material for theatre. The 'body' of the world, transformed into the 'body' of the film stock, was the raw material for cinema. The analogies now were almost absolute and immutable. As we can see, Gan's ethic repeated Volkonsky's almost word for word although it is true that he only repeated what corresponded to the mechanistic laws of nature. But the sudden move towards the declarative machine cult concealed the continuity of ideas. Kuleshov responded actively to Constructivist slogans. In an unsigned article, 'The History of the State Institute of Cinematography', published in Kino-Fot and probably written by Kuleshov, Gardin was given a 'dressing-down' for distancing himself from the 'left-wing tendency', and the orientation towards the 'mechanisation of human movements' was proclaimed. 66 The short period of rapprochement with the Constructivists played an important role in the later evaluation of Kuleshov's work and in his break with preceding tradition. But Kuleshov was too closely linked to the ideas of the new anthropology which had their roots in the 1910s. It is precisely this that doubtless explains in part the unexpected move by Kuleshov and his entire collective (Pudovkin, Barnet, Komarov and others) to Mezhrabpomfilm, the most traditional film studio in the 1920s, which preserved the best traditions of the pre-Revolutionary Russian cinema. The names of Delsarte and Dalcroze can be found in Kuleshov texts over a period of many years and this has puzzled researchers. By the end of the 1920s they were already being perceived as strange anachronisms. It is symptomatic that as late as 1924 an orthodox figure like Alexander Voznesensky, who belonged entirely to the pre-Revolutionary Russian cinema, persistently recommended the methods of Dalcroze and Delsarte as a means of achieving the maximum 'incarnation' [vzhivanie] in the character, 67 prolonging in his own way the Gardin line of film theory. In the later Kuleshov texts (after 1929), which have until recently served as the basis for the evaluation of this film theory, montage and the anthropological ideas of the 1910s diverge, giving the impression of a strange eclecticism. The metro-rhythmic approach and the new anthropology differed in their methods of teaching the actor and of rehearsal but their direct link with the montage experiments of 1921 was lost. Nevertheless the idea of the actor moving along axes, which was subsequently to provoke such censure, is no more than a fusion of Volkonsky's concepts on the directions of the movement of the body and Ferdinandov's inclination towards recording the movements of the actor. They make complete sense only in the context of the principle of the identity between montage and the movement of the body, of their mutual rhythmic resonance. The methodology of the training of the model actor, which was experienced in Kuleshov as a period of intensive research in the field of the 'synthetic' theory of cinema, rudimentarily preserved within itself the anthropological principle of montage. The history of Kuleshov's theoretical research reminds us once again of the fact that for thousands of years the human body has served as a model for the universe, from the theory of macrocosm and microcosm to the physiognomic teachings of the eighteenth and nineteenth centuries. This traditional metamodel has evolved from the intact body of the Middle Ages to the dismembered corpse of the nineteenth century. The idea of montage as the specific basis of a new art, cinema, is an important link in the long history of this evolution.